Looking back to February I could say, it was slow! All month I got only 5 new species, which brought my 2013 year list up to 154. So, lets look back and see how did this month go? First Sunday I spent time with Kevin Dailey and Diane at Nocatee Preserve in St. Johns county, we tried to relocate reported Hairy Woodpecker. We walked about a mile or two, but no sight or sound of Hairy. It's a hard to find bird in Florida. If it shows up somewhere, it's a big deal. 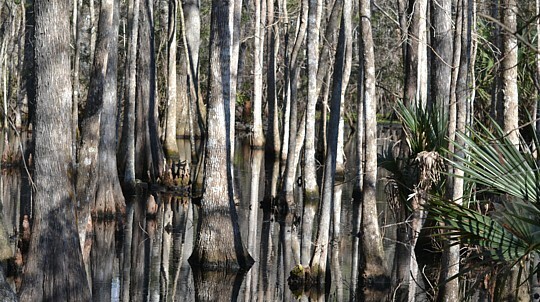 On a way back to the parking lot we heard flock of blackbirds making a lot of noice nearby wetland woods. We could clearly hear Red-winged and Rusty Blackbirds. I had no previous experience with Rusties, but Kevin was sure that some of them are Rusties. Also Diane agreed with him. I tried to see if I could spot them, but ground was so wet that I couldn't get close enaugh. So, I just recorded them with my phone and left them there. Still, it was a new bird for me. I found my first Duval County year bird for this month at Spanish Pond. Spanish Pond is a good birding spot for all kind of interesting birds like Buntings, Wood Ducks and Green-winged Teals. I was just about to leave from there when I noticed Sharp-shinned Hawk flyover. His long square tail and typical wing shape was clearly visible. I snapped some pictures but bird was already pretty far away, so it didn't get much on a picture. Still, bird number 150 for my year list. My second year bird was an American Oystercatcher. I can't say how many times I tried this guy in January with no luck, but now I got it in Fort Georg Inlets. That day I was birding on Fort Georg Island, walking on a trail when Kevin happened to cross by doing his own birding, so we continued together. Didn't find much, but Kevin mentioned about the Oystercatchers in inlets. Of cause I couldn't let them go, so I drove back and there they were, right in a open area by the water with gulls and peeps. When I was looking Oystercatchers another intresting plover got my eye. He was very odd looking, and stayed nearby Black-bellied Plovers. Here is the picture I got of this leucistic Black-bellied Plover. Same size, same shape and bill, very light, and no black-bellied markings. 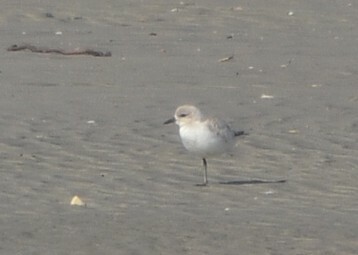 Looked almost like giant sanderling. I heard my first Northern Parula of this year at February 13'th at Theodore Roosefelt Area. Northern Parula is really common bird for a summer time, but rare for that early of the year. Still, the song was unmistakable. Just in case I recorded it, if I have to prove it for eBird. Next two birds were February 24'th at Hanna Park beach area. Sandwich Tern was resting with Royal and Fosters Terns, and Gulls on the beach. This is the bird I been chasing lately heavily with no luck, but now I finally got it. I still need a Caspian Tern, hopefully I can get that one in March. When I was walking back from the beach area I noticed little bird nearby. I thought first, it's a Song or Savannah sparrow, but as soon as I lifted my binoculars I saw blue overflush. 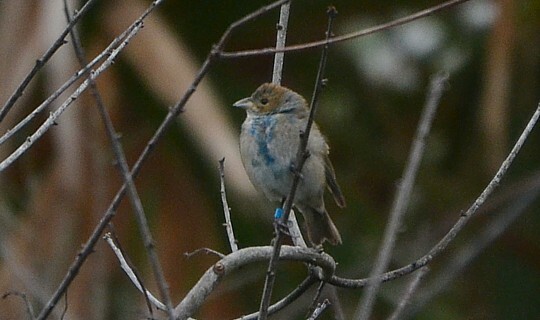 That was an Indigo Bunting. Nice! That early. That was interesting looking little guy, and also he had blue band around his foot, which I noticed later looking my pictures. Would be interesting to know when and where he was banded. I reported him to the banded birds center. So, that's it for the month of February. I finished it with 154 species for my 2013 year list. I wonder what the March will bring. Will see, stay tuned! Spring is coming and also the birds. It's gonna be interesting month.